Today I write a letter to my clothes, and a few other inanimate things that have made my everyday life better. Not in the same universe as people and pets, not even close, but these have served me well, kept me covered, and safe. Thanks for being there, for suiting me just so, and keeping at least one area of my life low-stress. Thanks for being so affordable and accessible in the big scheme of life, and putting a smile on my face. Even when I have to replace you, I’m grateful you were there for me. 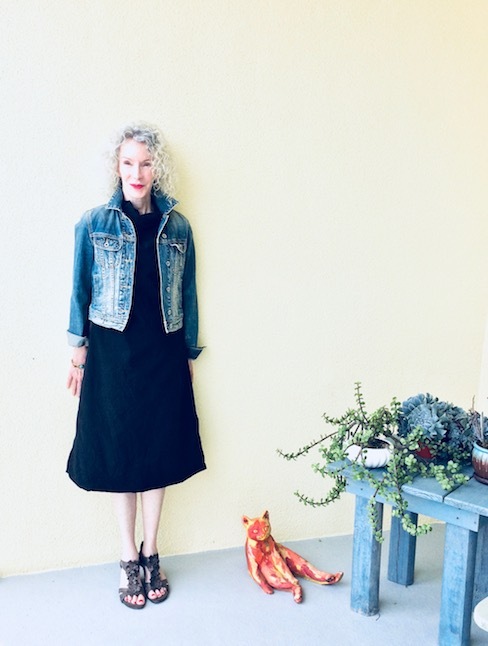 Denim jacket, because you are always on-trend (we don’t care about trends but it’s true), you have an easy-going personality and you look good over everything, from silky sundresses to turtlenecks. My latest denim jacket is a thrift find, by Lucky Brand. I feel lucky! Thanks to my oxfords and funky boots, you help give my mostly-neutral wardrobe a kick. You’re surprisingly cute with dresses and skirts, and make me look like I have an opinion (I do). 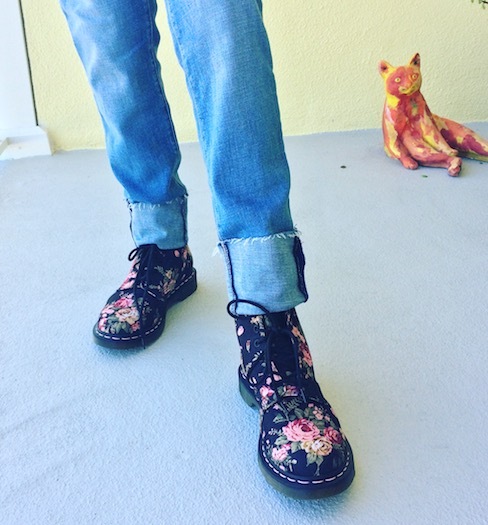 Floral Doc Martens are among my favorite footwear. Cuffed jeans: You’re the best jeans I’ve had in years (Loft jeans), you’re just the right length and width, and you don’t get all stretched out. And your cuffs always look well-done. Hair that’s thinning. I almost never thank you, because well: thinning. But you’re easy to fluff and go, you love the rain and humidity. I really appreciate your silvery goodness. And an additional thank you to Toppik for blurring my thin spots. My fine, thin hair does have good curly texture. 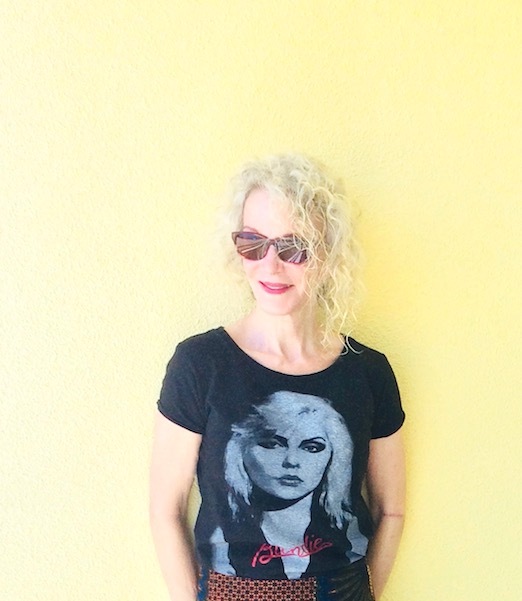 I found an amazing new blue shampoo that’s toning down the blonde: Fanola No-Yellow Shampoo. Super soft old tee shirts. You are the best. I might wear one of you every day, if I didn’t have to take an occasional pic for the blog. You’re my reliable friends who migrate from out-to-dinner outfit, to jeans and sneakers, and finally to bed-only. Thanks for always being around, and costing less $$$ than lunch. 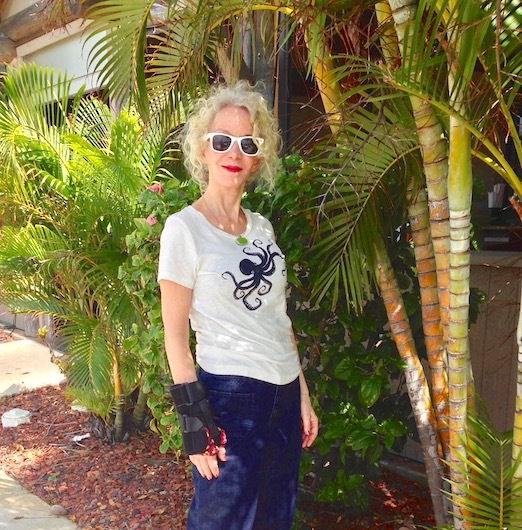 A well-worn octopus tee from Modcloth is one of my favorites. upon your website and in accession capital to claim that I get actually loved account your blog posts. Nice post Patti! This is a lovely idea and reminds us to be grateful that we have many choices when it comes to things to wear, unlike many women who are restricted by finances, body shape, religion, or occupation. These things are so helpful in our everyday life—-love the cuffs on those jeans! Thank you for this reminder to have gratitude for everything that comes into our lives. I just love your cute octopus t-shirt! A post of gratitude is never amiss. Although I love my clothes for brightening my life it is of course my health that I need to be grateful for, without which, my life would fall to *hit. I fell down the stairs on Sunday and it was a big reminder to never take my health for granted. Thankfully I’m only bruised and very sore with some pulled muscles…no broken bones! Whew! When these things happen and you’re living alone it can be scary. You’ve given me pause to reflect on all the wonderful gifts in my closet for which I am thankful. May I add to your list? I’m thankful for all the hands that made those clothes–from farming the land and animals that grew cottons and provided silks, leathers, and wools, to those that made the raw materials into fabrics and shaped them into garments and shoes. I am thankful to the land and animals that provided their rich soil and their bodies so I can stay warm and comfortable and well-covered. To the sun and rain for doing what they did to grow those raw materials that fed the land and the animals…. I could go on but I’ll end with a thank you, Patti, for bringing this great reminder to be thankful for all we have. What a well written and inspiring post PattI ! We should all take some time to acknowledge the things that we treasure and not take them for granted. This is very much related to my recent post. I agree a super soft T-shirt is the best. Your graphic T-shirts are always so on point. Your hair may be thin but I do love the whispy quality of it. Have a wonderful week ! Yes…we should be thankful!! Because when it comes right down to it, we are super blessed !! Well, I certainly enjoyed this one! Yes, I have my old favorites and seems like it’s about time again to purge. Get rid of the things that hung around without being loved….I really must love something now when I try it on, at home or in a store, or out it goes or back on the rack! And I love love love your curly hair. I use a blue tone shampoo conditioner by Hawk. Love it and it is free of all the nasty chemicals. It’s the Blue Chamomile…. And yes, the denim jacket! My great niece gave me one of hers when she lived with us and I wear it with everything I have in my closet….a true workhorse of clothing. Have a lovely rest of your week! That should read “by HASK”, sorry about that!